Both the cigar and crown flower come together to make an exquisite ensemble! 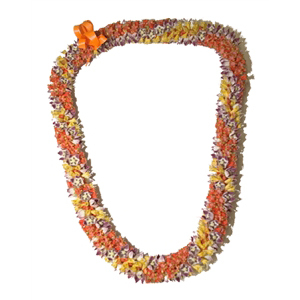 The enduring cigar lei is made from hundreds of tiny cylindrical flowers of the Cuphea Ignia plant which are a blazing red and orange with a white tip. From its appearance (a burning cigar), this flower got its popular nickname. The crown flower was a favorite of Hawaii’s revered Queen Liliuokalani. Like the cigar flower, its name appropriately describes its appearance—for it looks like tiny crowns. This is a special and unique lei to present to either male or female.